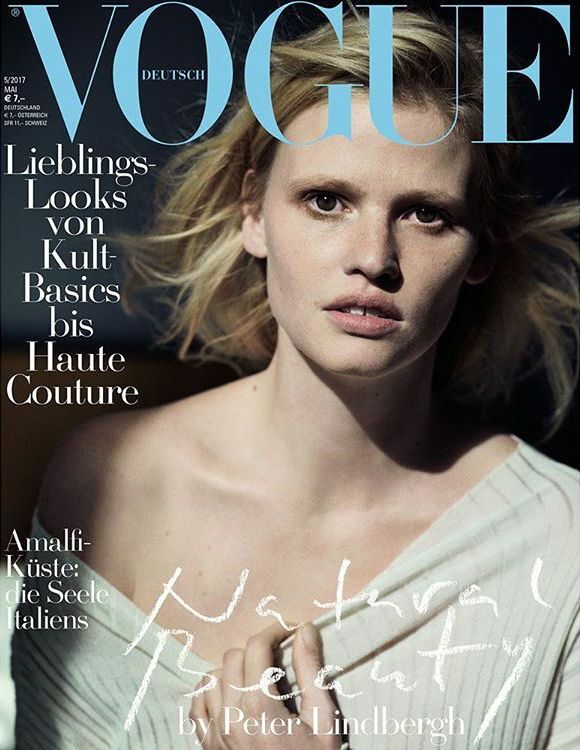 Models Kate Moss, Lara Stone and Irina Shayk bare their natural beauty for Vogue magazine Germany, May 2017 issue. Photographed under the lens of legendary Peter Lindbergh and styled by Christiane Arp and Clare Richardson; the famous trio showed off their effortless beauty for a series of black and white photographs. The inside editorial also features new comer models Sara Grace Wallerstedt and Birgit Kos. For the cover image Lara posed in Giorgio Armani sweater, Irina was dressed in Haider Ackermann for her cover while Kate oozed seduction in Gabriela Hearst slip dress. One of the most iconic supermodels Kate Moss bared her natural beauty for Vogue Germany May 2017. Russian beauty Irina Shayk photographed by Peter Lindbergh for Vogue Germany May 2017. Dutch bombshell Lara Stone photographed by Peter Lindbergh for Vogue Germany May 2017.